Implant supported dentures allow patients who are missing some or all of their teeth experience greater comfort, easier chewing, and increased confidence! Gone are the days of upper dentures falling out while yawning, lower dentures that never stay in place, avoiding certain foods, etc. Drs. Nicholas and Carla Calcaterra have helped dozens of patients transition from traditional dentures to implant supported ones. Come browse our many success stories we’ve completed in our Orange, CT office. Implant Supported Complete Upper denture. The 4 metal housings on her denture lock into the 4 implants seen above. She now has the closest thing to her natural teeth! Photos and case by Dr. Nicholas Calcaterra. The patient above had a traditional denture that never stayed in place. In addition, because her palate was covered with acrylic, she was unable to enjoy the taste of certain foods. 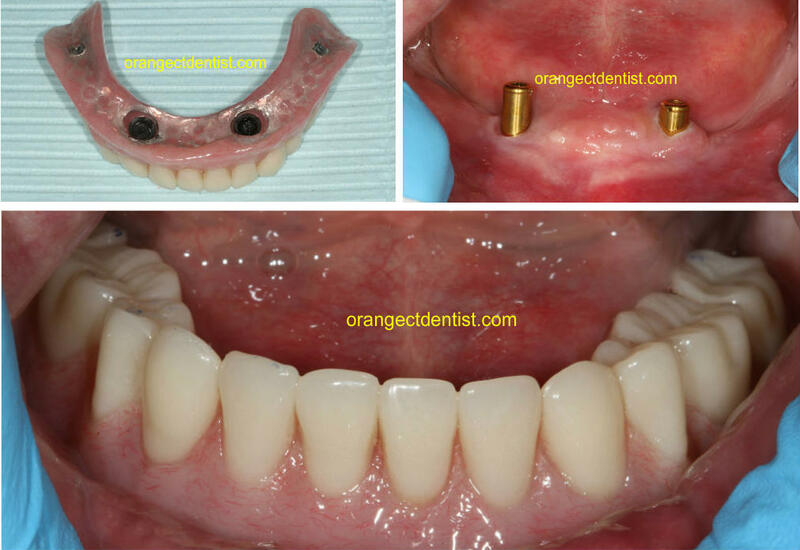 She had four dental implants placed, as can be seen in the upper right picture. A custom denture was then made which screwed into the implants. Cases like these can be described with two words: Life Changing. She went from never smiling and constantly worrying about her denture falling out to smiling, eating whatever she wanted, and enjoying her life again! 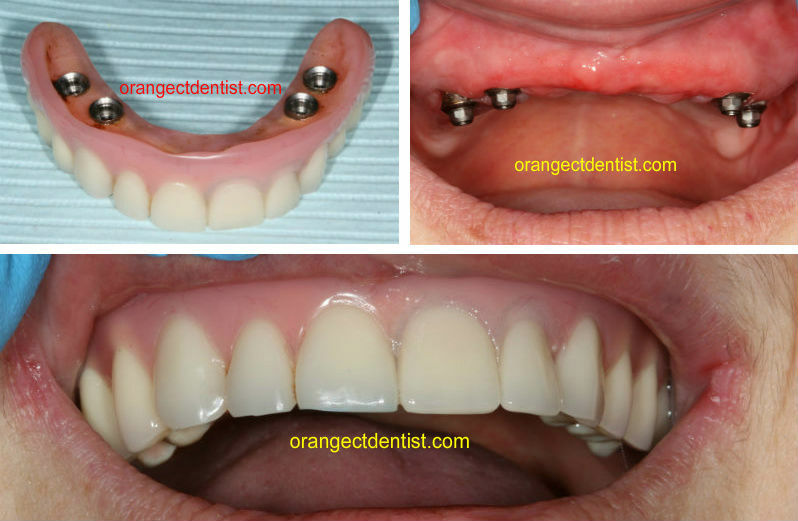 The upper left photo shows the underside of the lower denture in which two implants (upper right) will snap into. The bottom photo shows the denture in place. Case and photos by Dr. Nicholas Calcaterra. This patient walked around with denture adhesive (Fixodent, Poligrip) in his pocket for many years. He had very little bone on his lower jaw to support a denture. Unless he was totally focused, the denture easily slid around. Multiple options were discussed with the patient and we ultimately decided on a lower overdenture supported by two implants. The denture “snaps into” the two implants, providing immediate stability and retention. This case can be described with three words: No more adhesive! The above cases are just two examples of different treatment options available with implants for those patients with dentures. We have helped dozens of patients from Orange, Woodbridge, and other towns to improve their quality of life! You are welcome to contact us for an appointment to learn more about the various options and which might be most appropriate for you. Call us at (203) 799 – 2929 or visit this page.